Is a Full Service Broker Right for You? In a world of discount brokers with $4.95 trades, is there any reason to return to full-service brokerage firms with their commissions that can sometimes run as high as $400, $600, or more per trade? Believe it or not, there are some of you that might be better suited for these types of full-service brokerage firms with their mahogany paneled walls, well-heeled brokers, and fine cut crystal glasses despite the substantial costs. With a discount broker such as Fidelity, Etrade, or Charles Schwab, you are simply paying to get your trades executed. For those with experience, the ability to analyze financial statements, and an understanding of businesses, this is an ideal arrangement. You just need someone to place the trades you order. And the good news is that there is such strong competition in this space that the cost of commissions has come down. In fact, many investments trade with no commission at all. 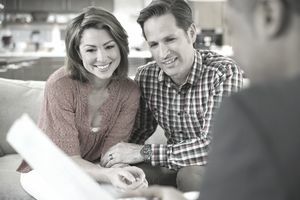 But for those without any financial experience or who want the comfort and security of handholding – and just as importantly, don’t mind paying for it – a full-service broker can be worth the cost. The abillity to handle unique trade requests. Access to initial public offerings. Perhaps the biggest benefit for someone without experience is the opportunity to have a reputable firm guide you through the process. Although it is highly probable that the fees will cut into your returns, you may be better off in the long run because a good broker can hold your hand through turbulent markets, helping you to avoid mistakes such as selling at market bottoms or buying during speculative bubbles. That is, of course, if you can resist the temptation to bail. It’s amazing how many investors, who are the first to admit they don’t know hide nor hare about the market, will call their broker and complain about a few percentage points drop. Just last week, I was chatting with a financial representative from a major U.S. bank in his office, and he confessed that when his client accounts were up more than 20% last year, no one called. Although a 4% drop in the broader markets caused, no joke, what he estimated were 250 calls to his office. That is madness. As long as you have a reputable firm with a proven history of good, long-term results, stay the course. There is one alternative to full-service brokers that is particularly attractive if you don't have a lot of capital to invest or you are primarily interested in buying and holding stocks for the long term (10 years or more). You aren't likely to hear about them because there isn't a motivation as they don't produce profits for any brokerage house. It's called a direct stock purchase plan or a dividend reinvestment plan. Basically, these low-cost plans allow you to buy shares directly from a company, paying only $1 or $2 in commissions through optional cash payments or regular, recurring withdrawals from a checking or savings account. Every quarter, you'll likely receive a statement detailing the reinvested dividends, purchases, sales, stock splits, or any other information that resulted in changes to your account.